Examples of publishers that might be included Marvel, DC, Image, Dark Horse, IDW, Dynamite, Valiant, Vertigo, Wildstorm etc. The comics may range from Bronze age to current/modern. There will be a good mix of titles. THE INFINITY GAUNTLET #6 KEY THANOS 1991 Comic book Marvel Avengers Endgame War . Shipped with USPS First Class Package. Bagged since new. I will also have others listed. 6 books for sale. 22, 105, 109 are in lower condition (readers). New ListingAvengers 257,1985- First appearence of Nebula! 9.6 Awesome! Nearly flawless book! Flat, sharp, glossy, great edges and corners, off-white pages! 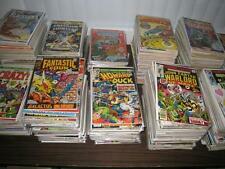 The Avengers 293, 291, 261, 260, Annuals 8, 9, 11,17. Shipped with USPS Priority Mail Flat Rate Envelope. The Avengers #242 (Apr 1984, Marvel). Shipped with USPS First Class Package. Avengers #257 (1985). Page Quality. West Coast Avengers #46 (1989, Marvel)1st App Great Lakes Avengers NM 🔥. Shipped with USPS First Class Package. WEST COAST AVENGERS #45 NM 1st WHITE VISION JOHN BYRNE #57 HOMAGE. Shipped with USPS Priority Mail. Infinity Gauntlet #2. Happy Comic buying! Infinity Gauntlet #5 FVF Key Galactus Thanos Avengers Endgame Warlock 1st Print! Cool lot of 80's Avengers comics, lot includes issues 288-290 and Annual 19, all in fine to very fine and close to near mint. Lex Luthor, The Unauthorized Biography, NM, 1st print. 1989, DC Comics. Amazing condition! MARVEL SUPER-HEROES SECRET WARS # 9 in VERY FINE condition from MARVEL COMICS. UNITED STATES ONLY. 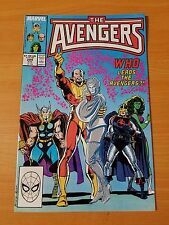 The Avengers 257 (Marvel Comics July, 1985) 1st App Nebula ,GOTG! 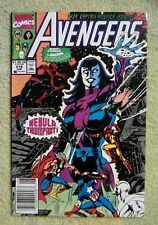 Avengers #257 (Marvel Comics, July 1985) 1st Appearance Nebula! There is spine wear, and creases on the cover. Wonder Man Lot Marvel NM+ High Grade 1-15 Special 1 Marvel Premiere 55 Nice! You get 18 books 1-15 and annual 1 from 1991 series NM High Grade 9.4-9.6 or better plus the 1986 special #1 High Grade 9.6 or better and marvel premiere 55 VF 1980 First solo book nice run Next Avengers Movie Hero coming soon!! 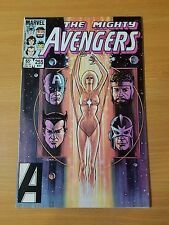 (5) AVENGERS COMICS. NO.263 JANUARY 1986. MARVEL COMIC GROUP. — CAPT. MARVEL app. NO.253 MARCH 1985. NO.255 MAY 1985. NO.257 JULY 1985. NO.260 OCTOBER 1985. MARVEL SUPER-HEROES SECRET WARS # 7 in VERY FINE condition from MARVEL COMICS. UNITED STATES ONLY. Up for sale is a copy of The Avengers, issue #262,"Many Brave Hearts" story by Roger Stern where Namor joins The Avengers. Art by John Buscema. Dated December 1985. This copy is about mid grade. This listing includes the following comic books: Hawkeye #1 (1983) Comic has a little bit of wear on it, a little bit of wrinkling on the cover and the pages are starting to yellow but nothing major, no tears, missing pages or anything like that, overall its in good condition for its age. Next comics on this listing are The Avengers #227 and 329 from volume 1 the original series released in 1983 and 1991. Both comics are in very good condition, the only flaw is that the pages are just barely starting to yellow a little bit but it's not bad at all. The final comic on this listing is Avengers Strikefile #1 (1994) comic is in excellent condition with no visible damage on it. Up for sale is. Infinity Gauntlet #1. This book is professionally graded by the CGC. This comic has a grade of9.4 and has WHITEPAGES. We recently obtained a large collection of comics! Big Avengers comic collection of 27 issues! Comics are in Fine to Very Fine condition. There might be a couple in Very Good condition. All comics are individually bagged and most have backboards. If you have any questions or would like more pictures. Please don’t hesitate to ask. Avengers Comics 27 Issues! Alpha Flight/ Spider-Man . Shipped with USPS Priority Mail. Infinity Gauntlet 2 3 NM Marvel Comics Combine Shipping Thanos Avengers 1991. Shipped with USPS First Class Package. Avengers Marvel Comics - lot of 46 (Copper/Bronze). Good for rounding out your collection. Marvel Super Action starring The Avengers 17, 20, 24, 26, 34. The Avengers. Read once and bagged run of The West Coast Avengers regular monthly series. News stand variant on #12. This is comic from my Collection as a kid. I just Re-Bagged and Boarded this so they are like new CRISP AND CLEAN! Infinity Gauntlet #3 VF+ Beauty Thanos Avengers Endgame Warlock 1st Print! Infinity Gauntlet #6 NM Gem Nebula vs Thanos Avengers Endgame Warlock 1st Print! Up for Bids is Fury of Firestorm #61 from DC. This is the Rare Logo Variant. This Book has been Graded 9.8 by CGC. This is a Universal Grade with the Blue Label. The Book Has White Pages. This is the Highest grade this book has received thus far. The CGC Certification Number for this Book is 2002371004. The Avengers #272 (Oct 1986, Marvel). Shipped with USPS Media Mail. Marvel Fanfare #s 10,11,12,13,14,15,16,17,18,19,1 Signed-F/VF,Combined Shipping! Marvel Fanfare #s 10-19-F/VF. # 16 is signed,on the cover,by artist Dave Cockrum. Photos are of Actual Item(s). "The Life that Late I Led.!". Story by Chris Claremont. Art by Dave Cockrum and Bob Wiacek. Plus, Havok is reunited with his father. This does NOT obligate you to buy the comics. Hobgoblin vs Jack O'Lantern. Silver Sable, Sandman and Sinister Syndicate appearance. Mockingbird: S.H.I.E.L.D. 50th Anniverary 1 CGC 9.0 VF/NM. Founded in 2000, CGC is the first independent, impartial, third-party comic book grading service. Prices on chart are for one book. United Kingdom 24.00 57.25.